A great one-pot rice dish is delicious even the next day. 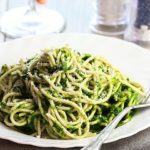 A side dish the whole family will enjoy! 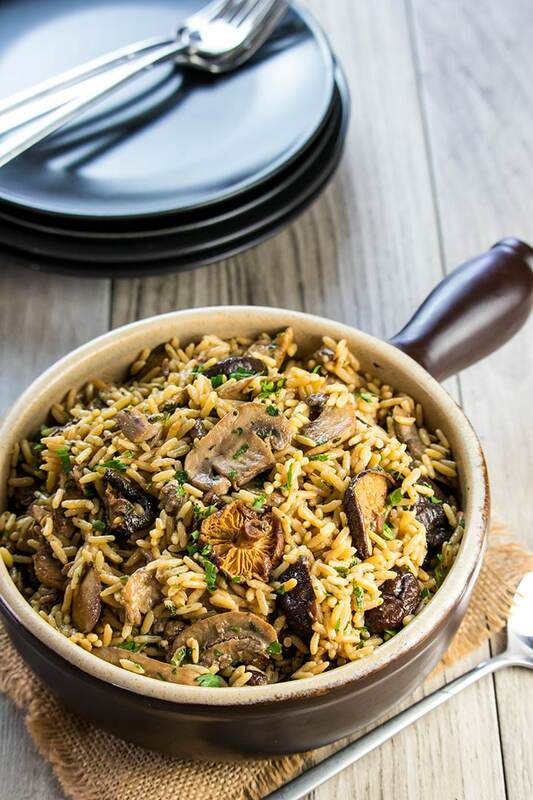 Perk up your dinner with this recipe for Easy Mushroom Rice Pilaf. 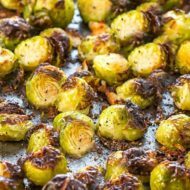 It’s the perfect side dish for busy weeknights. Who doesn’t love a good rice dish? 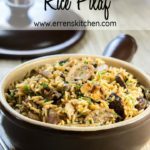 A one pot rice dish is even better! 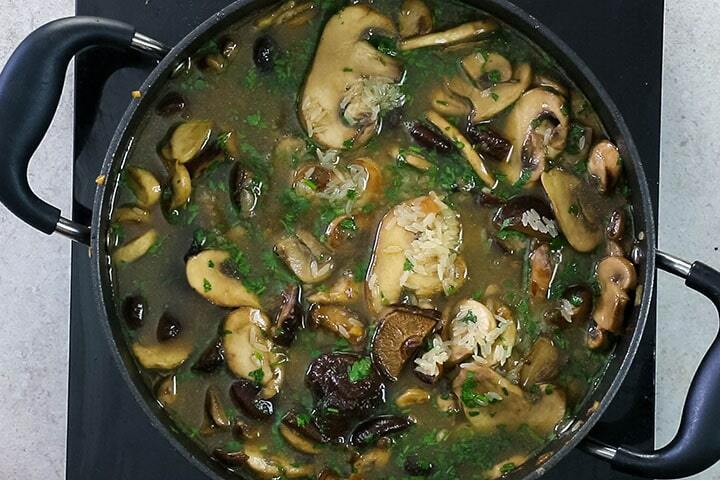 This dish uses dried mushrooms for extra flavor and uses the water they’re soaked in to make a rich mushroom stock. I have a vegetarian girlfriend who eats this as a main meal, but it’s a great accompaniment for anything from chicken to roast beef. The combination of both fresh and dried mushrooms gives the best possible flavor and texture. Using of the liquid for soaking the mushrooms as a stock, adds an extra depth of flavor you wouldn’t get with other stock options. 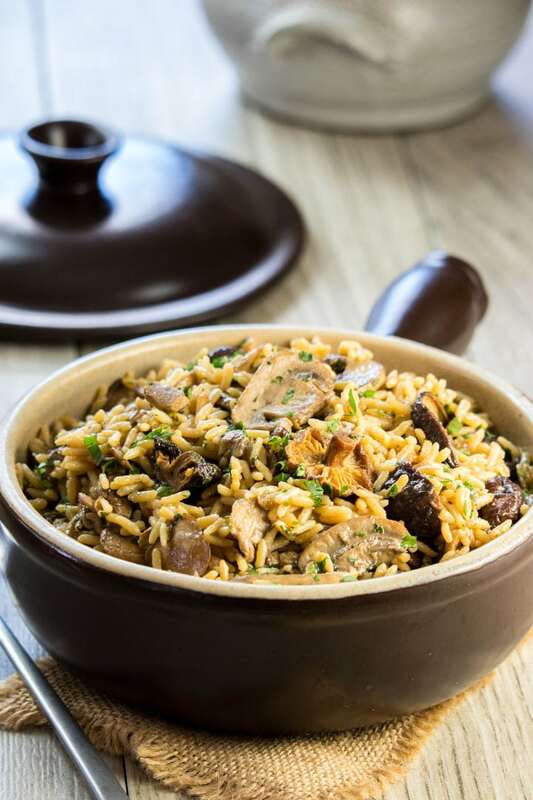 Using long grain rice produces firm rice that absorbs the rich mushroom flavor you can’t achieve with instant rice. The difference between white rice and rice pilaf is white rice is cooked in salted water, while rice pilaf is cooked or baked in stock or broth. 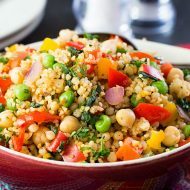 Rice pilaf is often a mixture of rice and pasta, but I find it’s hard to find pasta that has the same cooking time so I omit it altogether. The best rice to use for rice dishes such as mushroom rice or rice pilaf is a long grain white rice (such as Uncle Ben’s Original Converted, also known as Uncle Ben’s Long Grain Rice outside the US). 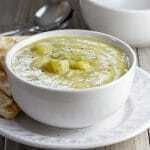 Quick cook or instant rice often results in soft, flavorless dishes. 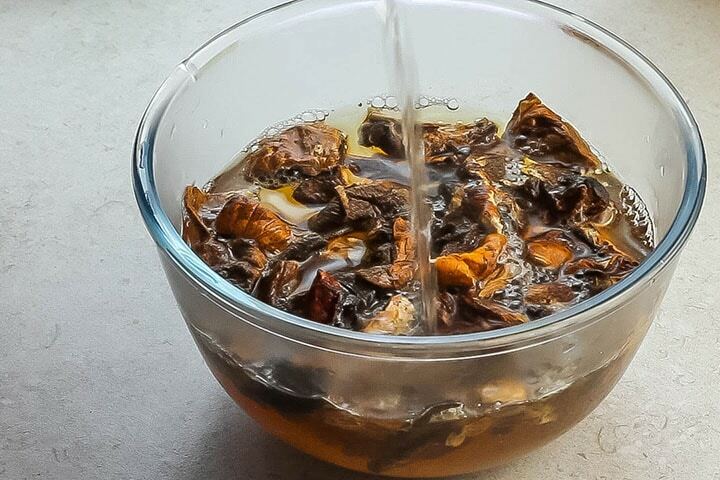 Start with soaking the dried mushrooms in 3 cups of boing water until tender. Once the desired softness is achieved, drain (reserving the liquid to use as stock) and slice into bite-sized pieces. Melt the butter over medium heat. 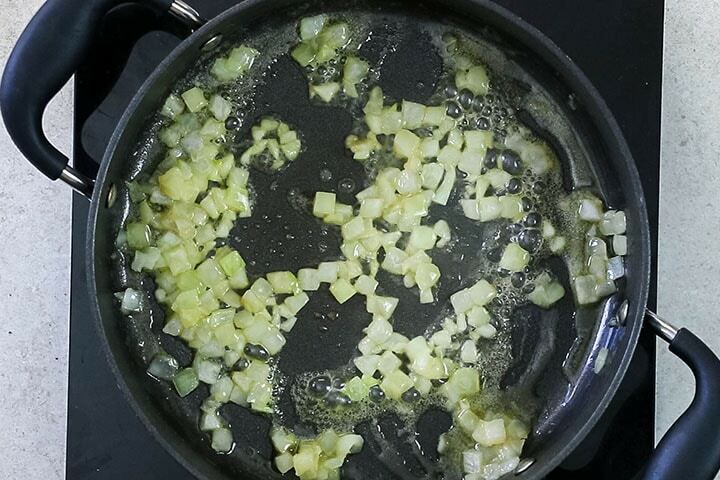 Add the onions and cook until tender. Saute until the fresh mushrooms are cooked. Add the rice and coat with the mixture. Add the stock, parsley, salt, and pepper. Bring to a boil, cover and simmer for 15-20 minutes or until the rice is tender and has fully absorbed the stock. Cleaning Mushrooms. It’s best to avoid using water to clean your mushrooms because will water-log them. 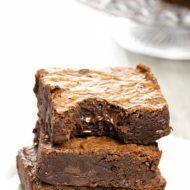 Instead, wipe them off with a damp paper towel before slicing. When cooking mushrooms, don’t overcrowd the pan. Overcrowding the pan will cause the mushrooms to steam as opposed to sauteing. When reserving the mushroom liquid be sure to discard any sand that collects in the bottom of the bowl. 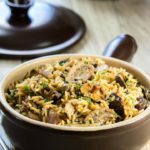 Can I freeze Mushroom Rice Pilaf? Put the freshly cooked rice, while it is still steaming (to keep it moist) into an airtight container, then straight into the freezer. Defrost in the fridge overnight. 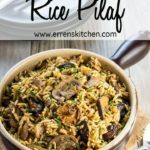 Is Mushroom Pilaf Rice healthy? 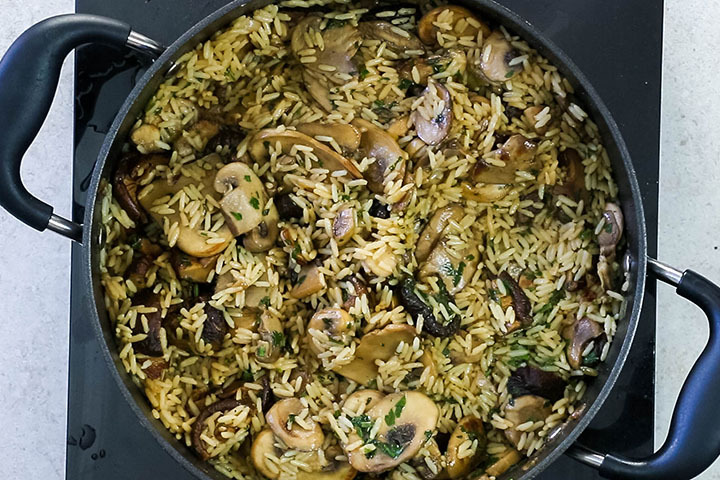 This mushroom rice uses a small amount of butter, however, if you want to make it even healthier you can use a cooking spray or olive oil. The choice is yours! 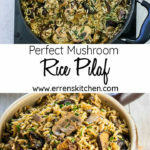 Can you re-heat Mushroom Pilaf Rice? 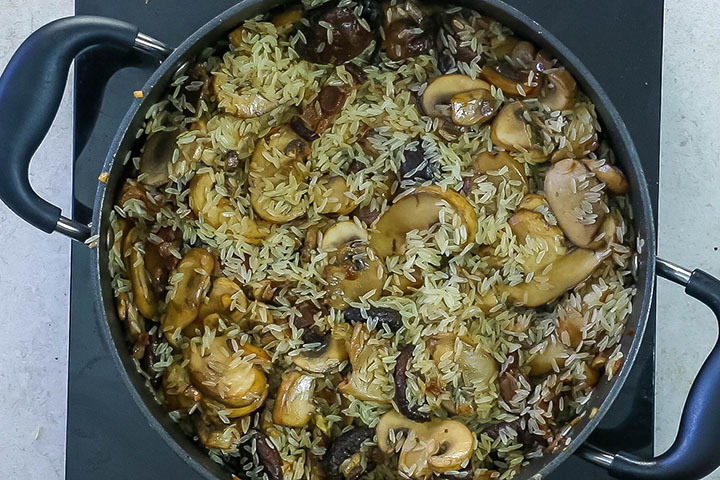 You can re-heat mushroom rice in the microwave, just ensure it is piping hot before serving. Don’t ever re-heat rice more than once! 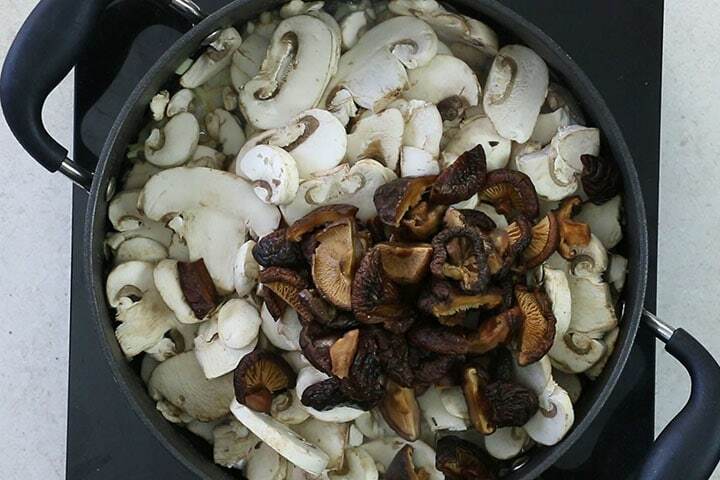 Once the desired softness is achieved, drain the mushrooms (reserving the liquid to use as stock. You will need 2 cups. Top up with water or stock as needed). 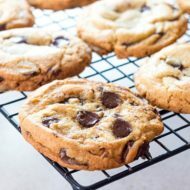 Slice into bite-sized pieces and set aside. Melt the butter over medium heat. 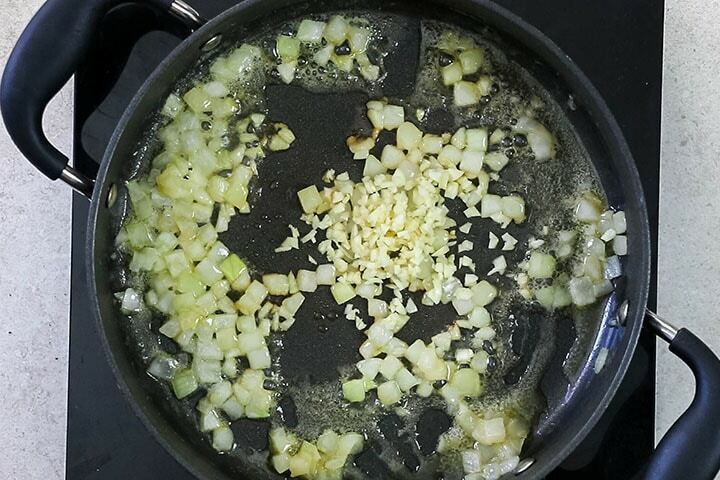 Add the onions and cook until tender. Add the garlic and cook another minute. Add the mushrooms and saute until the fresh mushrooms are cooked. Add the rice and coat with the mixture. Add the stock, parsley, salt, and pepper. Bring to a boil, cover and simmer for 15-20 minutes or until the rice is tender and has fully absorbed the stock. Cleaning Mushrooms. It's best to avoid using water to clean your mushrooms because will water-log them. Instead, wipe them off with a damp paper towel before slicing. When cooking mushrooms, don't overcrowd the pan. Overcrowding the pan will cause the mushrooms to steam as opposed to sauteing. The best rice to use for rice dishes such as mushroom rice or rice pilaf is a long grain white rice (such as Uncle Ben's Original Converted, also known as Uncle Ben's Long Grain Rice outside the US). Quick cook or instant rice often results in soft, flavorless dishes. This was a great side dish. It paired perfectly with our salmon. It was easy and perfect for us mushroom lovers! That does sound like a good combo Jackie! 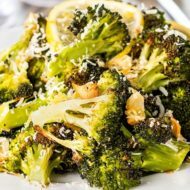 I love this for a side dish! 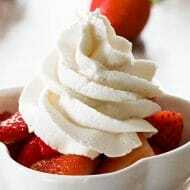 I have to make it very soon! 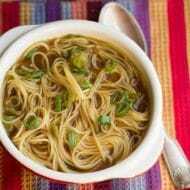 It is so quick and easy, you will love it! This reminds me of something my grandma made for me growing up. I’ll definitely be giving it a try! 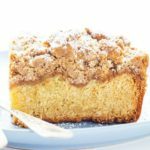 Grandma’s baking is always the best! I can’t wait to try this! Looks so good! This looks faaantastic!! I bet it tastes incredible! A must try! 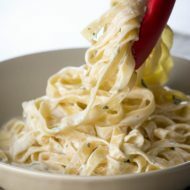 This will Definately be added to my weekly rotation of meals. This looks amazing ! 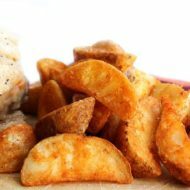 It is so quick and easy too, perfect for busy evenings! Mushrooms are probably my favorite veggie; and my picky eaters in our home love them too! 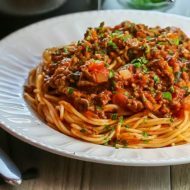 This sounds like a great dish to serve with dinner this week. Excited to give it a try! Thank you, Beth, Sounds like a winner!